Universal Tool Direct Drive Screwdrivers feature a precision controlled two-step trigger and internal handle silencing that reduces the noise level to 84 dBa. Universal Tool Direct Drive Screwdrivers also feature composite motor housing for weight reduction and operator comfort and a trigger mounted reverse lever. Universal Tool Direct Drive Screwdrivers are best suited for general duty light assembly. The UT8825RQ Universal Tool Direct Drive Screwdriver is one of thousands of quality tooling products available from MRO Tools. 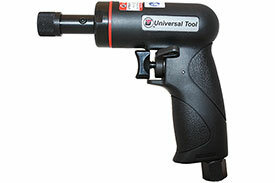 Please browse Universal Tool Screwdrivers for tools similar to the UT8825RQ Universal Tool Direct Drive Screwdriver. UT8825RQ Universal Tool Direct Drive Screwdriver description summary: Universal Tool Direct Drive Screwdriver. Motor (hp): 0.3 Motor (Kw): 0.22 Torque Range (in.lbs): 5-40 in.lbs Speed (RPM): 2000 Exhaust: Handle Chuck: 1/4'' Hex Q.C. Weight: 1.8lbs/0.81kg Length: 5.7''/145mm Air Inlet (NPT): 1/4'' Quantity discounts may be available for the UT8825RQ Universal Tool Direct Drive Screwdriver. Please contact MRO Tools for details.